Ground floor: Living/dining room with doors to terrace (fireplace, TV, DVD, CD with iPod dock). Kitchen (oven, microwave, dishwasher). Double/twin bedroom with en suite shower room and door to pool terrace. Double bedroom with en suite shower room and doors to garden. Washing machine. Central heating throughout the house. WiFi. First floor: Double/twin bedroom. Double/twin bedroom. Bathroom. Double/twin bedroom with en suite bathroom and door to upper terrace. Outside: Extensive terraced gardens/woods. Built-in wood oven. Barbecue. Open and covered terraces. Private parking. Private gated swimming pool (12m x 6m) with Roman steps. 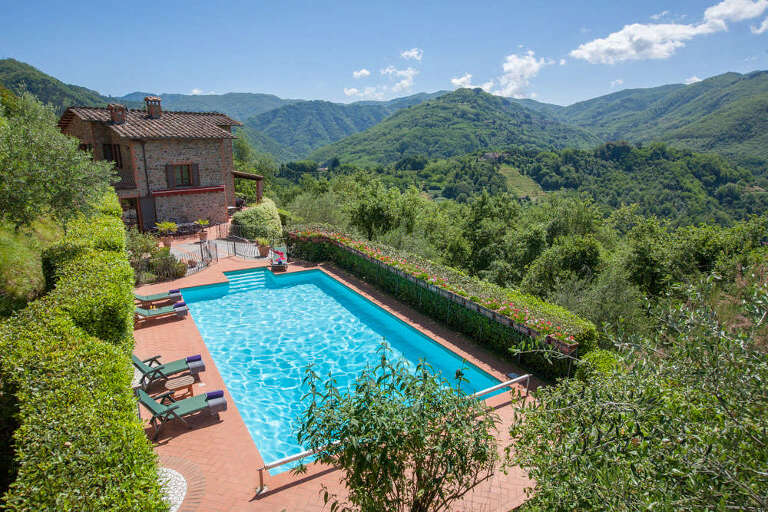 This tastefully restored stone property sits on the picturesque, wooded slopes above the delightful town of Bagni di Lucca. Perched on the edge of the tiny hamlet of Le Croce, its situation makes the most of the panoramic vista that surrounds the property. Step out on to one of the terraces and you are immediately greeted with far reaching views over the green hills and mountains of the Val di Lima and Serchio valleys, ideal for nature lovers and walkers. The terraced gardens of Villa Patricia follow the contours of the hillside, and slope down to a wooded area. Inviting areas for relaxing and enjoying the peaceful setting have been created throughout the garden and by the pool. Inside, the house is comfortable and welcoming, with large, soft sofas, a well equipped kitchen, and traditional features such as exposed stone walls and wood beams. Although in a rural situation, the nearest restaurant can be found in Granaiola, a five minute drive up the hillside. The pretty spa town of Bagni di Lucca (5km) offers a choice of shops and restaurants and sits on the River Lima. Nearby Barga (20km) hosts a music festival during the summer months, whilst Castelnuovo di Garfagnana (30km) marks the start of many walks through the countryside and mountains. To the south, the glorious town of Lucca is not to be missed and is easily accessible for an afternoon's sightseeing. For those who are looking for some sea air, the popular seaside town of Viareggio is under an hour's drive and the villages of the Cinque Terre are well worth a visit. Local access is via an unmade track, unsuitable for large people carriers or low slung vehicles. In four of the bedrooms, the beds can be prepared as either a double or a twin. Please advise at time of booking. The owners respectfully request that guests do not smoke inside the house. ... or a tandem for the day and cycle round Lucca. Buy fresh pizza dough from the local supermarket to spin your own pizzas and cook them in the pizza oven on the terrace. Buy an assortment of your favourite gelato (ice cream) by weight from the Gelateria in Bagni de Lucca and take back to the villa for desert. for the antiques fair held on the third Sunday of each month. ranging from Elton John to the Puccini Festival in September. admiring the Lucchesi families as they promenade on a Sunday afternoon and admire the 68 churches within the walls. birthplace of Dante. Enjoy a pizza at the pizzeria behind the bar on the right of the village square. a cool haven in one of the deepest gorges in Italy, full of ferns and rushing waters to cool you on a hot summer's day. only 45 minutes drive away, but avoid the hordes of Italians at the weekends. at the old coaching inn of Locanda Antica in Sesto a Moriano on the way to Lucca, 20 minutes drive away, admiring the asymmetric Devil's Bridge at Borga a Mozzano on the way. to the mediaeval Cathedral at Barga and on to the Garfagnana National Park, home of wild wolves and lush alpine meadows reaching up to the far peaks. and go to the underground caverns of the Grotto del Vento with its fabulous curtain stalactites, and 1, 2 or 3 hour explorations of the caves with an English speaking guide. and take one of the ferry boats to the Cinque Terra coastal villages or even to Elba. through the hills to the high peaks and visit the many hillside villages along the way. in the autumn and paint the varied colours and foliages of autumn. why not visit Pisa, Florence, Siena, Orvieto, Greve in Chianti, San Gimignano, Volterra, 2-3 hour drive of the breakfast table and bring back scrumptious bottles of the best Italian wines from the region to enjoy with your dinner. and pick the cherries in June, the figs from May to October, the apples from August to October, the grapes from the vines by the pool in September/October. below the house for a hot spa bath and massage. to slowly to reveal the hidden villages nestling in the hills or lie on the sun warmed patios and count the stars in the deep blue velvet night sky. and watch the fireflies coat the slopes of the garden around you with a shimmering blanket of twinkling lights with the song of the cicadas in the background.